A brother came round to do his work briefly from the church office earlier this week. After making some phone calls, he said; ‘wow pastor, it’s good to be patient; right now I have just gained a huge margin (profit) in my business because of patience’. He then went ahead and shared his testimony with me. Without knowing it, God just used him to confirm the story and lesson I planned to share with you today. There was a salesman called Ramesh in Kerala, a state in the southern part of India. He was honest, polite and hard working. It was the month of June (the start of monsoon in Kerala) when he got his first assignment in his new office. He was given a list of prospects whom he had to approach and sell the product to. Surprisingly, he realized that the list was full of local laundry owners! He got scared and thought he wouldn’t be able to achieve the desired target. He approached his manager but got little help, so he went back to his desk, thought for a moment and accepted the challenge as he had no other option. The next morning he started approaching the laundry owners and within 15 days he got some really nice responses. Almost 80% of them purchased his product but, in credit, and everyone promised to pay him off within the next 15 days. He was delighted as he knew that his job was almost done! But he didn’t know that the next one month was going to be tougher than what he expected. On the last week of June amidst heavy showers he started visiting the laundry owners’ shops to collect money. After visiting half of them, he realized that he had collected not a single penny and the same trend continued for the next 7 days. He was frustrated and demoralised. Ramesh explained everything to his manager including the peculiar behavior he noted amongst the laundry owners – whenever he knocked. The owners would look at the sky and then ask him to come the next day. Listening, his manager smiled once and said that he was ‘on track’ and would soon get some good results. He never realised for once what the payment had to do with the sky! After almost 14 days, on a bright sunny Monday morning Ramesh started visiting the laundry owners once again. Though it was in the midst of monsoon season, it didn’t rain heavily for the last three days. Suddenly by noon Ramesh realised that he had collected the payments from almost 50% of the laundry owners which was almost unbelievable! He worked hard throughout the day and by the day end he had completed 90% of his target for June and July. He was thrilled and so was his manager. By month end, he went on to become the ‘star performer’ for the month of June, July and was handed over the letter of confirmation by the management. It was like a roller coaster ride for him! Yet he wondered what the sky had to do with the payment! Why the laundry owners looked at the sky and tell him to come the next day? To solve this mystery he went to a laundry owner and asked the same question. The owner laughed at him and said, “Son this is the month of monsoon and we have to wash the clothes, dry them off, iron them before handing them off to the customers. Now, if the sun doesn’t shine how can we dry our clothes, earn enough to pay you?”. 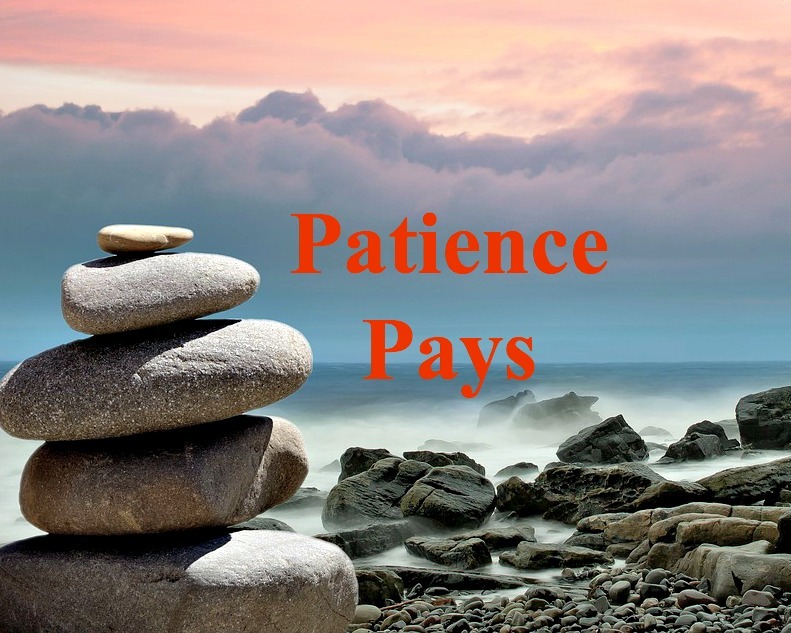 Patience pays; it helps us receive God’s promises to us. We have to develop patience. Do not give up too easily, do not quit because your victory is coming forth soon. Next Next post: Fight Your Way Back!